Blue mussels, the predominant species used in aquaculture in Maine, may be more resilient than other cultivated species to the increased seawater acidity and storms predicted to hit the Gulf of Maine as a consequence of climate change, according to a University of Maine research team. 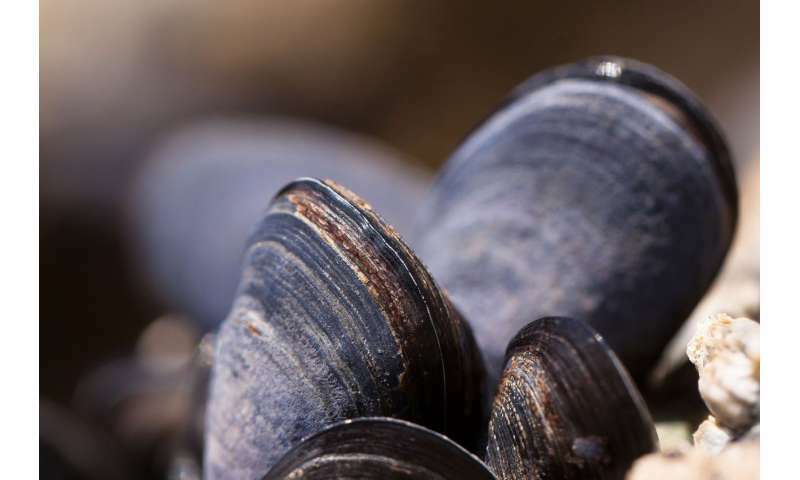 A study led by Tim Bowden, an associate professor of aquaculture in UMaine's School of Food and Agriculture, suggests that ocean acidification does not appear to affect the strength of byssal threads of blue mussels, which anchor the commercially important aquaculture species to their substrate. The findings, published by the scientific journal PLOS ONE, contradict similar studies on other mussel species. The study was conducted in the Ocean Acidification Lab in the Aquaculture Research Center in collaboration with the Advanced Manufacturing Center and Hollander and de Köning mussels, with funding from Maine EPSCoR's Sustainable Ecological Aquaculture Network (SEANET).